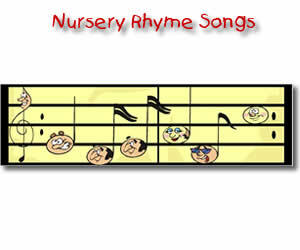 Nursery rhyme songs have long been used with children's activities and beginner readers. As children sing their favorite nursery rhyme song , they develop a feel for the rhythm of the poetry they recite and chant. Nursery rhyme songs help children connect with familiar characters and help them learn the alphabet and beginning letter sounds. Through nursery rhyme songs, children listen to their favorite rhymes, and are able to identify words that sound the same. With use of a visual aid, children become aware of chunking. Learning is reinforced through movement. Fingerplays or dance can be added to all nursery rhyme songs. Songs can be a fun way to learn to read!